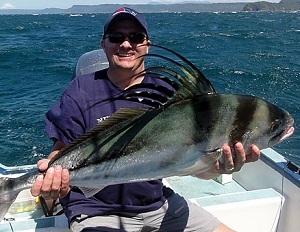 The fishing in Costa Rica is excellent, with many opportunities for world class sport fishing. The Caribbean coast offers great tarpon fishing. There is good freshwater fishing on Lake Arenal. The Pacific coast is well documented as one of the best places in the world for bill fishing. The Pacific coast of Costa Rica offers excellent offshore sport fishing opportunities up and down the coast. The most commonly targeted fish by anglers are marlin and sailfish. Wahoo, mahi-mahi and yellow fin tuna are also common. The best fishing for all of these species is on the continental shelf, which is about 15 – 20 miles offshore, depending on where you start from. The Golfo Dulce, located in southern Costa Rica is an exception as deep waters can be found within a couple miles of shore. It is one of the best places in the world for bill fishing with numerous world record catches caught by captains and boats in the area. Fisherman that do not want to spend the time and money to target offshore fish can have a great experience fishing for roosterfish, snapper and snook closer to shore. Fishing in Costa Rica is not cheap, with the average full day (8 hours) of offshore fishing priced in the $1,200 range. Inshore fishing will usually cost around $300 – $600 depending on whether you go for a full or half day. You will not find shared boats that you can join. Boats in Costa Rica are only available as a private charter unless you find someone to split the cost with you in advance. While there is good fishing in Costa Rica, it is essential to utilize the services of a good, experienced captain. An experienced captain will find the fish and put you on them. An inexperienced captain will usually equate to a long, expensive day with nothing to show for it. Bill fishing is good from December through July, though fish can be caught year round. The best months are February through May. The Caribbean coast is well-known as a top destination for tarpon fishing. Good tarpon fishing can be found just a few miles offshore or in the rivers at certain times of the year. The tarpon grow big in Costa Rica, with many growing up to 200 pounds. Similar to offshore fishing on the Pacific coast, you will want to hire an experienced and reputable captain and boat. The mangroves in the northern Caribbean provide good fishing for guapote and snook. Both fish are fished similarly to the way you would fish bass in the United States. The reef fishing off the Caribbean coast is pretty good as well. The only problem is finding a good guide as there are few on the southern Caribbean coast. Lake Arenal is the largest freshwater body in Costa Rica. It is a man-made, dammed lake which was created by ICE for the generation of electricity back in the 1970s. Over the years the lake has evolved into an excellent fishery. Lake Arenal offers anglers a chance at catching several species of cichlids as well as machaca. 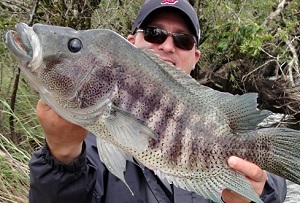 The most common cichlid anglers go after is the guapote, specifically “Parachromis dovii”. Guapote can grow in excess of 10 pounds, though the average fish is in the 3 pound range. They feed on insects and baitfish. Anglers fish them similar to the way you would fish for a smallmouth bass. They will hit top water lures such as buzz baits or stick baits near weed lines in the early morning and evening. Deep diving crankbaits work better from 7am – 5pm. Machaca are like a toothy miniature tarpon. They can grow up to 8 pounds or more, though they average around 2 pounds. Machaca will hit top water or crank baits just a guapotes will. They have large teeth, so be careful not to place your fingers near their mouths. Also, referred to as Lake Cote, Lake Coter is excellent for guapote fishing. The only problem is the entire shoreline is private property. That said, there are a couple of local guides that have access. Casting crankbaits or trolling them is the best method for fishing Lake Coter. There is pretty good fly fishing for machaca on a little river that feeds Lake Arenal near Castillo. If you follow the dirt that leads to Rancho Margot all the way to the end, you can access the river. There is actually decent trout fishing in the upper Rio Savegre, near San Gerardo de Dota. Someone stocked rainbow trout years ago and they can still be caught if you go far enough off the beaten path. The best price rarely translates to a good day of fishing. It usually translates to money and a day of your vacation lost. If you do pick up a boat off of the beach, ask to see their gear first and also make sure you tell them that you expect for them to bring the bait with you versus catching it. If they do not have bait, keep in mind, you will likely spend half of your fishing trip catching bait. We have also created a Costa Rica sport fishing map for a more visually appealing presentation that will allow you to see when and where to catch the big one.